These pro-quality lenses turn the handiest camera—your phone—into a superb, versatile photographic tool. 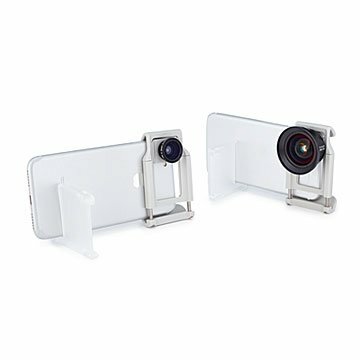 No worries about compatibility: the durable Clip, included with both, mounts them on the front or back of virtually any phone (hello, better selfies). Just clamp it onto your phone, attach the lens of your choice, and achieve phone images you never have before: urban and rural landscapes (or sharp close-ups), vivid beach vistas, you-are-there travel scenes, and keepsake-worthy group shots. Caps and soft lens bags included. Made in Taiwan. Fits any smartphone with width ranging from 2.3" to 3.2".